Autosomal Matching – Is Great-Grandma’s Brother Really Her Brother??? Do you remember story problems from grade school? You either loved them or hated them. There was no in-between. Here’s a modern-day story problem, and love them or hate them, if you participate in autosomal DNA testing, you’ll need to know how to work this story problem. The good news is, I’ll show you how. Yep, I was one of those “loved them” people. I received the following query about how to determine relationships between distant relatives, and what should be expected. It’s hard to know how interpret results if you don’t know what they “should” look like. “I have conducted traditional genealogical research on my father’s maternal side. I have researched back to my great, great grandmother. Her parents were enslaved yet it appears that her parents cohabitated since 1864 according to a document that was produce well after that actual time. My genealogical concern is because the date of 1864 is well after the oldest child (my great, great grandmother) and two other children were born. This lead me to believe that the three oldest children within this family were perhaps the father’s from a previous relationship. The lady who appears as his wife since 1864 would have been 13 when my great, great Grandmother was born. Though my great, great grandmother married and remained in North Carolina, her parents and the remaining siblings migrated west. I am presently researching the siblings to present day descendants. One such person I have contacted, I believe is the grandson of my great, great grandmother’s brother. I have been talking with him and his family. Unfortunately, they know very little to nothing regarding his grandfather. I have just conducted an autosomal DNA test on this grandson of the person I believe is my great, great Grandmother’s brother. I have a total of four participates within my father’s side to compare him against. The comparison is against myself, my 1st cousin and my uncle and my aunt. Yet, none of us are showing an autosomal match to this grandson. The only thing that I notice is that I as well as my uncle match another person who in turn also matches this grandson. When I receive queries like this, the first thing I have to do is to make a chart of the relationships. The people who have taken autosomal tests are shown below in bold. Now that we can see who is related to whom, or who we hypothesize is related to whom, now we can do some useful math. First we need to look at how far down the path the participants are from the original ancestors. We know that autosomal tests are fairly reliable until you get to about the 1% range, then it becomes sporadic and more the roll of the dice in terms of how DNA was inherited. In this scenario, we have 5 generations in total, so the percentage of DNA that the descendants carry of the ancestors is shown in the following chart. You can count generations in either direction, but for purposes of showing percentages I’m counting beginning with Mom and Dad. Ok, so if indeed these people are all descended from Mom and Dad who were together in 1864, we are well above the 1% threshold. Now let’s look at how much DNA each of the people who participated can expect to share with each of the other participants. For this, I’m using the ISOGG DNA Statistics page and the chart that shows percentages of DNA in common between various relatives. To use this tool, the numbers relate to “self”, so you need to figure out who is the “self” relationship you are calculating. So let’s build another chart – a relationship chart. In our chart, we’re going to have two math columns, one that shows percentages of DNA shared if both great-grandma and her brother are descended from both parents, and one if they only share one parent, so are half siblings. Bolded people below are those who have taken the autosomal test. So here we have a quandary. We are very close to that 1% mark, so let’s look at the various scenarios. The best chance of a meaningful match are at the third level where the aunt and uncle have both tested to see if they match great-grandma’s brother’s son. The next generation, the participant and his first cousin are both another generation removed, so less likely to match than the aunt and uncle who are closer genealogically. Great grandma and her brother are full siblings. If this were the case, we would expect for the Aunt or Uncle to match the grandson of great-grandmother’s brother at about 3.125%. Neither do. It’s not likely, but not impossible that they are full siblings. Great grandma and her brother are half siblings. If this were the case, we would expect to see about a 1.5% match. This is perilously near that magic 1% number. They don’t match, but because of how close they are to the threshold, I would not call this conclusive. How to solve this mystery. The participant states that while they don’t match each other, there is one person (called the stranger, below) who matches himself, the uncle and great-grandma’s brother’s grandson. This may or may not be relevant to the question at hand. However, it is worth pursuing. If the match were on overlapping portions of the same chromosome, then it’s a good bet that indeed, it is from the same ancestor, but it’s not. At this point, there are only three things to do. 1. Test more people. If the grandson of great-grandma’s brother has siblings, test them. Better yet, if he has an aunt or uncle, that gets us one generation closer. If there are more people in the generation of the aunt and uncle who could test, from any descendants of great-grandma, test them. If another descendant of this family could be found from another line to test, that would be great. Given that DNA is divided in each generation, and is passed in clumps, each person inherits differently. Therefore, the more people you test in a line, the better your chances of finding a definitive answer. 2. Use GedMatch. All 4 family members, plus the stranger who matches the participant, the uncle and the grandson of great-grandma’s brother download their results to GedMatch, drop the comparison thresholds, and see if you have matching segments on identical chromosomes between the stranger and the three family members. 3. Have Tim Janzen phase these people and obtain his opinion on the relationship after his phasing. Phasing is where in essence Tim attempts to genetically “recreate” (on paper) the common relative between the uncle, aunt, participant and first cousin, and then compares that “composite person” to the grandson of great-grandma’s brother. Tim has written specialized tools to do the phasing and provides the consulting services to compare the results. There are also some other possibilities that need to be considered, based on the history of this family and America during that time. It is extremely unusual for children to be with a father during or after slavery. Children belonged to the mother and the owner of the mother. The father may or may not have been on the same plantation. Slavery was an enforced matrilineal society. 1864, the date given that this couple began to be “married” is likely the date of emancipation. In other words, it could have been that they had children together but were forced to live apart before this, or that they decided when they were freed to become a couple. If their children had death certificates, that might provide the answer. The children could have belonged to either the man or the woman of the couple, or the children before 1864 could have all had different “other” parents. Slaves often formed loving relationships when they could, but they were not allowed to “marry” nor were their family ties always respected when financial decisions came to be made regarding the slaves. Slave women were not always in charge of their own bodies in terms of the ability to choose with whom they would and would not have children. The children may not all necessarily belong biologically to the man and woman. The end of slavery was a difficult time and if there were orphan children, they could have wound up with any family who would take them. They could also be related, but not as children. Perhaps nieces, nephews, cousins, etc. We don’t have a definitive answer today for this particular story problem, but now that we understand how to use the tools and what to expect, I’m confident that this family will find their answer. This entry was posted in Autosomal and tagged Basic Education by Roberta Estes. Bookmark the permalink. I think your article was very informative. I have went even deeper into the Generational Caves. I am at 14 Generations now and have built up some confidence to go even farther back in time. 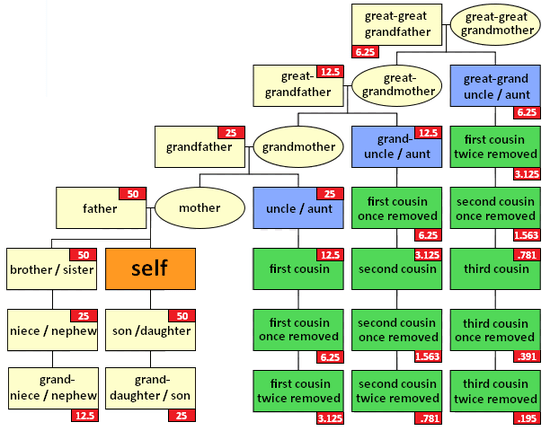 Using a combination of Y-DNA analysis and atDNA analysis (along with some very relevant genealogical records), I have developed some expertise in exploring 10th and greater cousin relationships going back 300+ years. That quest involved DNA testing of 10 persons. I have developed some formulas about the further back in generations you go …. the more people have to be tested to minimize false positives and meet certain probability range requirements. It’s almost a 1 to 1 relationship … going back 10 to 15 Generations = 10+ people that need to be tested. Also when digging that deep, the more atDNA SNPs in the test the better. In that regard, 23andme wins out over FTDNA, AncestryDNA (they don’t provide raw results! ); Geno 2.0. I have had to roll my own to get the answers. Everybody has a little piece of the puzzle, but it’s not all in one place. Doug McDonald has some good PCA / BGA analysis … but he lacks things like a Reference Population for Wales and other regions of the world. This 2012 PLOS article “Cryptic Distant Relatives Are Common in Both Isolated and Cosmopolitan Genetic Samples” http://www.plosone.org/article/info:doi%2F10.1371%2Fjournal.pone.0034267 gives much better details and more reliable statistics than the ISOGG piece you cited. Vadim Verenich at http://magnusducatus.blogspot.com/ is doing some really great work on identifying and scoring single populations versus continental populations as 23andme and FTDNA do. I think Tim and others doing work on Phasing are doing a great job. I would enjoy hearing from others about this. Greatly informative post! But wouldn’t there be one more level to the relationships? The writer referenced her great-great-grandmother but the chart shows the relationships from a great-grandmother. So they expected dna % shared would be even less than shown. I went and looked again. The woman at the top labeled Mom (beside Dad) is the great great grandmother. The daughter is the ggm, The next daughter is the grandmother. Then the 3 siblings, one of whom is the parent of the participant. Then the participant. I think this is right. I also asked the participant to proof and approve this after it was written.